“The Thanksgiving House” starring Emily Rose airs November 15, 20 and 25 on Hallmark Channel. “Christmas Incorporated” starring Steve Lund (the Colorado Kid) airs November 15, 19, 22, 24, 25 and December 7, 8, 16, 17, 25, 27 on Hallmark Channel. “Best Christmas Party Ever” starring Steve Lund (the Colorado Kid) airs November 20, 21, 29, 30 and December 11, 12, 30 on Hallmark Channel. 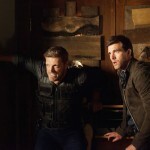 Interview with Haven Executive Producers Matt McGuinness and Gabrielle Stanton about episode 520 and the Colorado Kid. (2) A troubled person (a Colton family member) can create temporary Thinnies. Vince was laid up at the hospital when the Colorado Kid died. How do those guys know about Duke, if the Shroud is still up? The young actor playing Dave was AMAZING. He had the mannerisms down pat! Nathan’s plan depends on Duke and he doesn’t seem worried. Look how far we’ve come. If the Chief knew about future Nathan and what future Nathan told him, I wondered why he continued to talk to Howard. Long con?